Goat is a popular dish in some countries like Philippines and Mexico. Goat meat is different from lamb and beef because goat has less fat and is thus good for your diet. 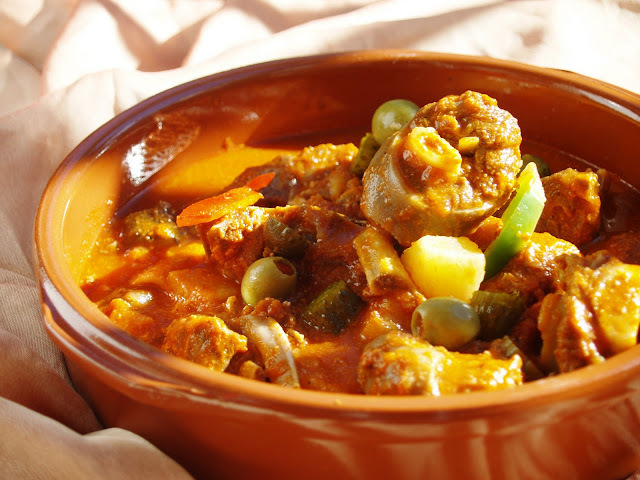 The perfect way to cook goat is to boil it with sauce or grill it on low temperature until it is tender. Kalderetang Kambing is one of the meat dishes every Filipino has come to love. It is a favorite pulutan and is a requisite during fiestas. You can always find it in the menus of authentic Filipino restaurant. 1. Marinate the meat in vinegar, garlic, salt and pepper for at least 15 minutes. 2. In a casserole, sauté: garlic and onions in oil. Then add tomatoes, red & green pepper and chilli peppers. 3. Add in the beef, tomato sauce, liver spread and water or stock. Salt to taste and let simmer for at least 1 hour or until the beef is tender. 4. Add cheese and olives (optional) and continue to simmer until the sauce thickens. 5. Serve with plain rice. For a special kaldereta, do not use water or beef stock. Use an equivalent weight of onions to the beef (1 kg of onions : 1 kg of beef). The onions will serve as water to the dish.